Without soil and water conservation and sustainable soil improvement, poverty will increase, not only in rural areas but also in urban areas as the cost of food and water increases. Resulting economic migration will inevitably add to city slums, child prostitution and slavery. The good news is that this grim scenario can be transformed: it is not inevitable. The decline of soil fertility, the erosion of soil, and the rainwater run-off that lead to poverty and migration can be stopped and often reversed. 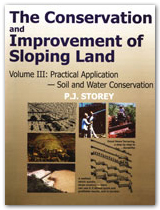 The key is better understanding of, and so better management of, soil fertility, combined with a range of soil and water conservation practices, accomplished by practical methods which are desirable, do-able and durable. 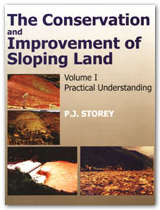 Volume 1 of The Conservation and Improvement of Sloping Land – “Practical Understanding” – is aimed at those involved in policy making, administration, or teaching. 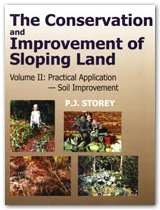 Volume 2 – “Practical Application: Soil Improvement”, and Volume 3 – “Practical Application: Soil and Water Conservation” – are aimed at those who are mainly interested in practical application, such as field-level NGO’s extension workers, farmers, and students of practical agriculture, agro-forestry, horticulture, and soil conservation and improvement.